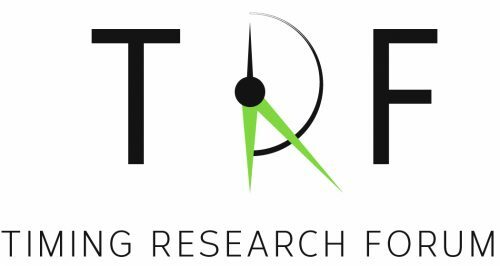 We are pleased to share the January 2017 Newsletter of the Timing Research Forum. The statistics reveal that we have a highly active research community that continues to grow! Please join us on these platforms to discuss and share research on timing and time perception. We are pleased to share details of the 1st Conference of TRF and announce the call for symposia and abstracts as below. 8 Symposia will be selected from submitted proposals. Each symposium must be focused on a single topic and will include 3 oral presentations of 20 minutes (+ 5 minutes questions) organized by a chairperson, who can also be a presenter. There can be 4 oral presentations if preferred, but the total duration of the symposium should not exceed 1 hour and 15 minutes. The chairperson is responsible for submitting the symposium proposal and for recruiting speakers. Symposia on current topics and of a multidisciplinary nature are encouraged. The title of each presentation, with a list of proposed speakers, their affiliations and contact information. For multi-author papers, please underline the presenter. There will be two short oral sessions, each containing 6 presentations of 12 minutes (+ 3 minutes for questions). There will be two poster sessions, and around 15 posters will be selected for oral blitz presentation (5 minutes). Specify whether you apply for a student travel grant (see below). The website for the conference will be launched soon, and will provide more details about the program, venue, as well as practical information. Abstract submission and registration will be coordinated via the website. For any queries, please contact Anne Giersch at – trf.strasbourg@orange.fr. We have a number of excellent blogs reviewing recent papers on timing and time perception by a number of promising early career researchers. Please read, share, comment and discuss! If you’d also like to contribute as a blogger, please get in touch: trf@timingforum.org. Does Sense of Smell affect Sense of Time? Do beta oscillations predict the timing of upcoming stimuli? We would like to invite TRF members to submit short summaries of their recently published articles on timing. Articles should be no longer than 500 words and not include more than one representative figure. Please submit your entries after your paper is published by emailing us at trf@timingforum.org. Submissions are open anytime and will be featured on the TRF blog page – http://timingforum.org/category/blog/. We would like to invite TRF members to write about their experience of a timing conference/meeting/workshop that they have recently attended. Submissions can highlight prominent talks/papers presented, new methods, trends and your personal views about the conference. Pictures may also be included. Submissions should be no longer than 1000 words. Please submit your entries to trf@timingforum.org within two months from the date of the conference. For example, see Molly Henry’s blog on the state of timing research at the Society for Neuroscience Annual Conference – Society for Neuroscience 2016. We would like to invite all researchers to share links to their timing projects on ResearchGate with us. We will collate information about all projects in order to share them with the TRF community on ResearchGate and beyond. For further details on these timing meetings, please visit – http://timingforum.org/timing-meetings/. If you are organizing or aware of any other meetings focused on timing, please let us know at trf@timingforum.org. TRF aims to host timing related resources, so that TRF‘s website will be the one stop for everything related to timing. Currently, the TRF website has these resources: all members’ publications, timing related special issues, and books on timing, a list of meetings focused on timing, a list of timing related societies/groups, as well as code and mentoring resources. We ask all of you to contribute to these resources. Please send us (email at trf@timingforum.org) any omissions that we might have or any new information that should be added. TRF is based on the idea of sharing information freely between its’ members so as to advance timing research and group collaborations. Thus, we encourage all of you to share with us any of the above resources that you might have and/or suggest new resources that we should add and circulate within the community. We thank all of you for supporting this community and hope that you will continue to do so in the future. As we continuously emphasize, TRF is meant to be open to all timing researchers with the aim of sharing ideas and advancing the current state of the art. Thus, we are open to any suggestions or ideas that will help TRF grow and advance. We have already established many ways (website, mailing list, resources etc.) to discuss the current state and the future of TRF and these tools will become more active in the coming months. We look forward to your feedback!